Basics first: I played 105 sessions, with 108 different people in a total of 266 hours. That is 30% gaming hours less than 2017 but with the same number of different people. I played mostly online. 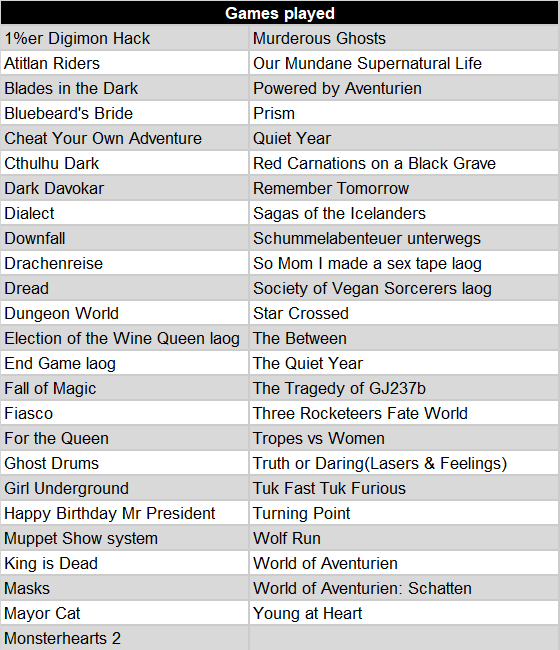 The only public events I played was in a gaming café in San Cristóbal, Chiapas, and the German FeenCon in Bonn. Two third of all sessions were organized by me. 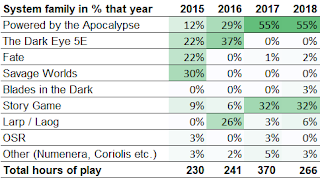 I played 49 different games in 2018. As a highlight, I would like to mention the session with Vee Hendro of her game Our Mundane Supernatural Life. It’s a short slice-of-life game for two players in which the length of each scene is determined by a die roll which gives the endings a wonderfully open touch. The Monsterhearts sessions with Jason Cordova were another delight again, especially his New York ballroom setting True Beauty (to be found in Gauntlet Codex Joy 2). The ongoing (?) game of The Tragedy ofGJ237b is a game which still keeps me thinking of its themes. 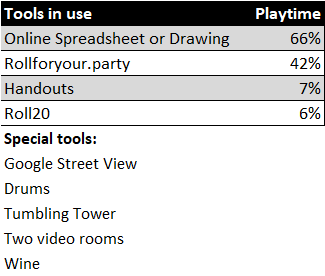 I set up a rollforyour.party room for the game and distributed the link. The game demands from you to not enter the room, otherwise the game is immediately over. I haven’t entered the room anymore. I don’t know if anybody has, what happened there. It’s actually not my business. But I want to know, because it's inherent to me. The top system I played was World of Aventurien, my World of Dungeons hack to play first edition The Dark Eye style. Of it, the most time I actually played a hack of that hack which is the Schatten-Hack. The Schatten-Hack was specifically made to play one classic module of the biggest Dark Eye campaign, the Borbarad campaign. In Schatten im Zwielicht by Anton Weste, there is an organization of black magic wizards forming a group of agents going on missions all over the continent to break the backbones of a sinister cult which is about to conquer the continent with the help of demonic forces. So, all characters in my interpretation of the module are wizards from this organization, called the Schatten (shadows). To reflect on this group composition, I added some elements of the Mage playbook, an alternative to the DW Wizard playbook. By now, I had 13 different players in the campaign – and each of them surprised me nicely how they took the premise and created a unique and interesting character with it. Powered by Aventurien is something I designed for my f2f group. They really enjoy their Dark Eye 5 character sheets and the Barbie play around them. I though wanted to play more like Dungeon World. So Powered by Aventurien simply allows them to roll on their long skill lists but we do the resolution on PbtA Moves designed for our purposes. 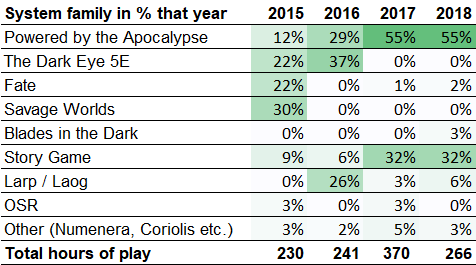 Summarizing which systems I play, it’s by far still Powered by the Apocalypse and the proportions haven’t changed at all in the last two years. Laogs have been important for my personal development, but they don’t play a significant role yet statistically. I tried Blades in the Dark but it wasn’t exactly what I like: too much crunch, I’m not a fan of flashbacks, I like my dice resolution straightforward without iterations and settings about violence and modern weapons are generally not something for me. I might still give it another try if I feel that somebody can transfer their excitement to me. 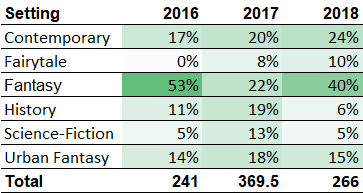 I hadn’t done the statistics in previous years, but it feels like that I continue to play more without a classic GM role. Some games have good reason in their design to have such a role, others would actually benefit from a re-write without that role. And for sure, there are examples vice versa. What I appreciate to have, is to have a dedicated facilitator, someone who knows the game, takes the lead on following the procedures etc. Keeping the game going is often an assumed GM role and when that role is not part of the game, the task is not picked up by anybody and that lets some GMless games look worse than they are. 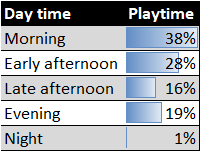 Given my daily routines, I could afford playing on different times of the day. To play with friends in Europe or in Asia, that is indeed very helpful and to have a game with a friend in Hawaii, me in Guatemala, a friend in Germany and one in Australia as we had it last year, you need to have this flexibility. My playtime this year was evenly split between English and German. I tried a bit Spanish gaming but my Spanish is unfortunately still not adequate enough for gaming. In 2018 nearly a third of my sessions were an hour or less long and I have to say that I really enjoy short and tight sessions. Actually, that is only half true. I like sessions where we take the time we want. One of my favorite sessions of 2018 was a session of Dialect. To be precise, the very first Dialect session played completely online. We decided to play two full three hours sessions for it and the game benefited a lot from this time. Paul Edson, who to my deep sorrow sadly passed away, made this game especially wonderful: we had moments of stillness, we had time for prayers and everything else what can sometimes happen at a table when the vibe is just there. Then there are these short sessions of thirty minutes. Tuk Fast Tuk Furious can be played that fast, as can Cheat Your Own Adventure, and both deliver so well in this short time. The two long sessions in 2018 were again my f2f group playing a complete weekend on our long Dark Eye campaign. That brings its own excitement. But as I wrote here on the blog before, this is only working for me, since we take care for our health by having enough sleep, taking breaks, fresh air and eating well and healthy. There wasn’t much change in terms of typical group size. 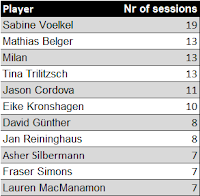 Three player sessions are on record-highs which had to do for one with the number of GMless games I played but also that I didn’t mind so much to be in sessions with only ‘half the players’ there, i.e. a normal four players plus GM set-up with two cancelations. Sessions with fewer players are anyway often more to my liking. 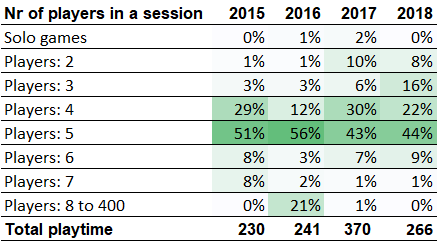 The tone in the sessions I was in, was relatively similar to previous years. This classification still is helpful for me since I do some cross-analysis with other information with it. That helps me to identify what kind of stories are actually fun for me and of what stories I should try to get more into my life. Same goes for settings played in. 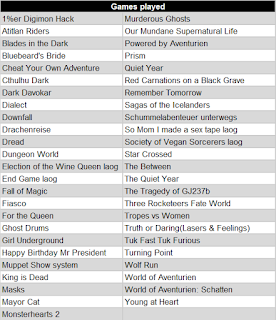 2018 saw a return of fantasy for me which was mainly an effect of my Indie SchwarzeAuge project. My never aging wish to play more sci-fi wasn’t fulfilled in 2018. Contemporary settings are more and more appealing to me and that shows in the numbers. 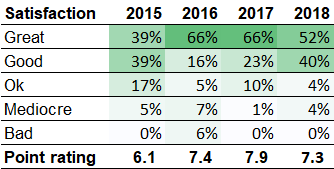 After updating the form from previous years, I dropped the satisfaction rating of a session. Instead I broke it down into three elements: quality of the story, quality of the technical set-up and joy with the system. I still decided that I can compare what I called satisfaction before with the quality of the story since this is what I mostly meant with it before. 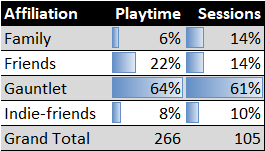 The chart shows that I’m less over-excited by sessions but generally very happy and never unhappy with my gaming. Playing from Guatemala with 2Mbit Download and 1Mbit was always a challenge, but most sessions went well technically. Sometimes, I had issues with my laptop. Beginning of the year, I finally bought a proper microphone (Blue Yeti Snowball) to improve my audio quality. Overall, given that I can play with friends from all over the world for free, I’m very satisfied with the low level of technical issues I had. 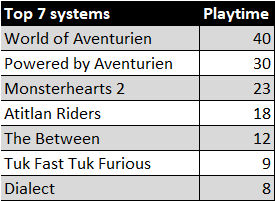 Different systems have a different appeal to me but most systems I tried were either great or good. I have already mentioned several systems which worked especially well for me. But I want to add that Star Crossed really flew for me. And also in 2018 The Quiet Year worked so well again. Both games I also played with people to introduce them to the hobby, and I think they were both doing a great job showing what RPGs can do. 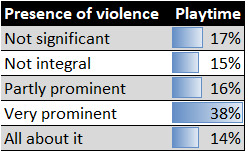 For the first time, I tracked the relevance of violence in my games. I kept it purposefully open what I meant with violence and analysed each session on an appropriate dimension: was there structural violence, physical threats or verbal abuse? As it turns out, yes, fantasy games are very often violent. But at least for a third of my playtime violence was not present at all or at least not integral to the experience. 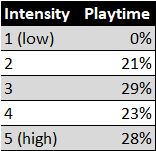 Another factor I have measured per session was play intensity. I asked myself how intense the most intense moment of the session was on a scale from 0 to 5. Nearly a third of my sessions had highly intense moments in them. That could have been a tight dialogue with a fellow player, a dramatic situation to which the story turned or moments of tension without anything happening. For example, in one Monsterhearts Mercy Falls 83 session, my character spent half of the session in locked in a coffin alone in the forest. Scenes were around various people visiting me but leaving again without help or me talking to myself about my destiny. For playing online, having a shared document for notes is a tremendous advantage and something I dearly miss in f2f sessions. Most importantly, having a character keeper is fantastic with information from all characters plus NPCs at one place. 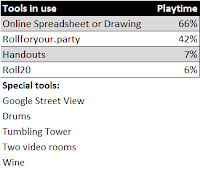 I also continued to use rollforyour.party as my dice and cards tool of my choice since it’s log in free, doesn’t track my data, is boiled down to the essentials and still easy to use. Especially cool was using Google Street Maps for Tuk Fast Tuk Furious. You decide at the beginning in which location you want to race and then people randomly drop in there on Street View level to create obstacles on the course of the track. Not noted statistically, but worth a point to discuss briefly, is safety. The Gauntlet has safety techniques like the X card obligatory and I highly appreciate that. Normalizing safety tools is super important. I’m happy that 2018 was the year that the German scene finally also opened up to safety tools. Even in the Indie scene there was some weird resistance in the years before. I haven’t used the X card in any game. I should have though. There were three sessions in 2018 in which I felt that I missed the moment it was relevant. I’m not going into details but the cases would have been clear situations in which an X card could have saved the moment and instead I struggled through the rest of the session. What I want to do is practicing the use of Safety Tools in my games more often. The Election of the Wine Queen has workshops to practice at the beginning for that reason. These exercises shall be fun and interesting on their own and not a burden to get through before the ‘real’ session starts. I had the X card used against me twice. Once was for bringing in an anti-Trump political joke which a fellow player didn’t want to have in the game. The other time a player brought it up against me as the GM since they were feeling that their character’s integrity was touched too hard the way I wanted to resolve a miss. We rewound and found a better way to resolve the Move. 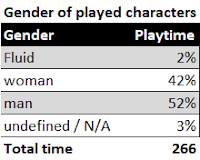 I played more men than women this year. Especially for NPCs, I still often fall into the default trap when not planning a bit ahead. That goes especially for fantasy monsters: too many orcs, goblins and the like have a he/him pronoun on them before I even think a second time. About who I played in detail, I recommend the Award Ceremony in the next article. I played wonderful characters again this year. Those who stayed especially close to my heart even after a while were those I played with my whole body, i.e. larp style. That doesn’t need to be a larp. For example, the Killer of All, the organizer of the Tuk Tuk race in Newcastle,Australia, was one of those characters I played with a bit of a costume, and my voice highly pitched. 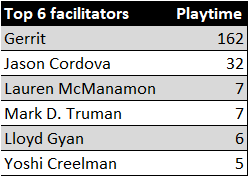 In terms of facilitators, I was back in the seat: I facilitated two third of all the playtime I had. Jason Cordova, who was number one last year is still on second place. Playing Fall of Magic with empathetic Yoshi, Masks in Lisbon with the highly energetic Lloyd, Blades in the Dark with the best educator Mark D. Truman, and playing her own games Girl Underground and Yuri on Ice with visionary Lauren was equally cool. My sessions were mainly with the Gauntlet but personal friends and family make up another good portion of my gaming life. I call Indie-friends game sessions with people I only know from the internet and still could become friends. These sessions usually came together through Google plus and Twitter. 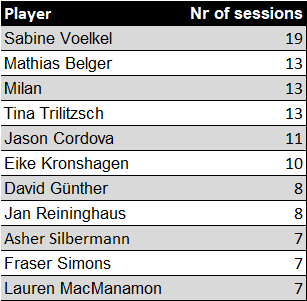 The most sessions I played with somebody was with Sabine with whom I played an incredible number of 19 sessions. And moreover, we met for the first time last in 2018 in real life which was so cool. Sabine is a player who usually knows what a session needs and plays towards it. She also is somebody who is giving me honest feedback in a way I can accept it and that is a real treasure. Mathias is the best diversified player in terms of RPG communities and that means he knows how things can be done differently. His blind spots are much smaller than mine and that is something I really appreciate. My son Milan is my life at the moment as a full time parent and that he still wants to game with me is making me really happy. He is not a fan of rules and the older he gets the less interested is he in dice rolling etc. He loves his gaming freeform and is brilliant in throwing complications in. Tina has a great analytical perspective on new games and is able to clearly state that something is not working for her and then usually it doesn’t. In gaming, I love to have her in sessions for her dry humor and getting us others back on track without us noticing. From the 108 people I gamed with, there were nearly two third I played with for the first time with in 2018. 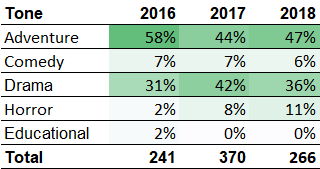 Another third were recurring players from the year before and only 7% of my players were with me already before 2017. That is really exciting since new players always demand changing perspectives, bringing other experiences with them and so on. Unfortunately, diversity keeps staying a problem in my groups. Part of it for sure is, that I’m a white, middle aged cis-man. 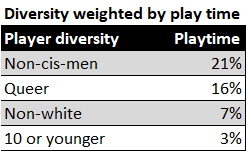 Which means that in a group of 5 players, there is already a proportion of 20% non-diverse at the table. Still, the percentages aren’t great. And the number for non-white players for somebody pretending to play truly international are devastatingly low. Part of an explanation is that I game so much more in German (which means with the German speaking scene). That scene is much less diverse than the US scene, as far as I can see. I hadn’t had a single non-white person in my German language sessions in 2018. My German gaming wasn’t very queer neither. My lesson for 2018: making game content more inviting is one thing. Changing power structures, i.e. where the money goes and supporting diverse people in the industry actively through hiring, scholarships etc. is something super important for the German scene to start soon. Looking at where I met the 108 players I had this year, I see the largest portion again coming through the Gauntlet. 28% of my players were not cis-men, which is an increase from previous year. Interestingly, my general satisfaction with a session increases with the percentage of non-cis-men in the session. Unfortunately, the sessions with 50% or more non-cis-men only make 14% of my sessions. And even worse, 41% of my sessions had only men in them. Another interesting observation: in games with a tone of drama, non-cis-men were over-represented, in adventure games, underrepresented. That’s it for dry statistics this year. Were they so dry? What did you see in them what I didn’t identify? How would your own look like?